Secondary structures can be recorded using several notations. Most of the experimental and published secondary structure data are just figures with bases shown to be either sensitive or protected from certain restriction enzymes or chemical agents. Because of its simplicity we decided to use the "bracket" style to represent the secondary structure of nucleic acids. We are aware of the fact that this syntax cannot represent in more detail the susceptibility of the bases to the enzymatic cleavage etc. If this turns to be a limitation we can improve this part of IRESite. At the moment this is not considered a drawback but rather one of the things which keep IRESite rather easy-to-use. The following simple rule can be used even for highly branched structures: the paired base being on the left-hand side from the stem axis should be represented by the left bracket, the unpaired base using the dot and the paired base being on the right-hand side of the stem should be represented by the right bracket. As already explained, this notation cannot quantify the accessibility of bases to restriction enzymes and chemical agents as well as it cannot represent pseudoknots, chemical modifications like methylations, pseudouridylations, atomic distances etc. There are more sophisticated notations (for example RNA-ML) but it is not clear whether most of the users would benefit from that syntax. Definitely, this would impose a serious burden on the curators and any other users submitting new data. We are open to discuss this issue with you. Reduced representation of the sequence and structure. Detailed structure of IRES segment has been determined only in few cases (Brown et al., 1991; Kieft et al., 1999; Odreman-Macchioli et al., 2001; Nishiyama et al., 2003; Spahn et al., 2004; Lukavsky and Puglisi, 2005). 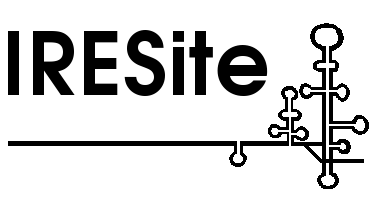 IRESite includes and will further continue to include secondary structures of RNA which were experimentally determined in IRES region. We employ simple but yet sufficient bracket representation (Hofacker et al., 1994; for brief comparison to other secondary structure notations see (http://www.tbi.univie.ac.at/~ivo/RNA/RNAlib.html). We are aware of various nice other notations which can represent even atomic coordinates and base modifications as well (the most comprehensive would be RNAML syntax; Waugh et al., 2002). However, the published data to be processed contain only limited information (whether an individual base is in a single- or double-stranded region). There is no information about e.g. post-transcriptional modification of such bases. Further, the structural data to be processed are often partly predicted consensus structures which prediction was constrained by experimentally determined criteria (base-paired or unpaired bases were or were not susceptible to enzymatic cleavage or chemical modification or were even derived by covariance analysis). We cannot represent the susceptibility of the bases to be more or less likely/strongly within a single- or double-stranded region (e.g. the so called breathing of structures reported sometimes). We cannot represent some of the base modifications (sequence data is represented in IRESite database using the IUPAC standardized letters (the extended syntax) but still this is not sufficient). Other databases like RNAbase (Murthy and Rose, 2003) are not ahead in solving this particular problem either (using the 3-letter syntax of PDB/NDB database) while their input data originate from totally different experiments. We doubt one could accommodate the extra information about modified bases while using secondary structure prediction programs either (ViennaPackage -- Hofacker et al., 1994; MFOLD -- Zuker, 1989, 2003; Thurner et al., 2004, Mathews et al., 2004). There are just no calorimetric data describing behaviour of such modified bases and thus calculations cannot account for them. Therefore, the user would anyway have to convert the representation to the more reduced format containing only information about paired/unpaired bases (to the format we use right now). Indeed, we will evaluate the possibilities to include such additional data into the database after more structural records accumulate and will improve the secondary structure representation if necessary. Needless to note, most of the IRES-related publications lack any secondary structure data and if they do contain some structures, mostly they are computer-based predictions (mostly MFOLD output). So, there are quite a few structures (about 20 -- 40 structures expected) to be accumulated and analyzed. Still, we have to include these few structures in the database as they are thought to be important for IRES activity and the goal of IRESite is to present all critical experimental data regardless the fact whether they are known in 10 or 4 000 cases.